Worcestershire farmers Marcus and Kathryn Bullock and their daughter Kate have seen a 2kg lift in scanning weights in the last 10 years and a 10% increase in lambs born alive at Bank Farm in Abberley. 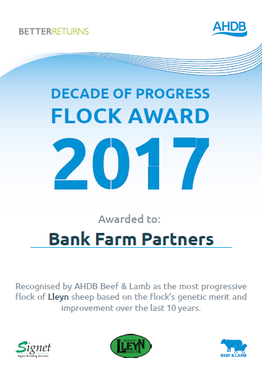 Their improvement was recognised with the 2017 AHDB Beef and Lamb Better Returns programme Decade of Progress flock award, after the flock index lifted from 49.17 in 2007 (breed average 97.16) to 167.85 (breed average 159) in 2017. The 3rd on-farm sale was held on Saturday 28th July by Marcus and Kathryn Bullock offering rams from their Bank Farm flock of performance recorded Lleyn sheep. The sale saw buyers pay an average of £990.00 for 48 rams sold on the day, with a new record price of 3400 guineas realized for Lot 13. The sale, administered by Worcester-based auctioneers McCartneys, once again conducted under the unique ‘Helmsman’ system, proved to be a great success with potential buyers in attendance from all corners of England, Scotland and Wales, as well as considerable new interest over the telephone from Lleyn breeders in Estonia who had visited the farm only one week before to view this years’ consignment of rams. “This concept has now been readily accepted, allowing all buyers the opportunity to bid with confidence on our full offering of rams, in the knowledge that every bid is completely transparent to those attending. The feedback from buyers has been extremely complimentary and they completely back the concept. The sale once again offered rams with sound FEC indexes in order to reduce reliance on worm drenches, and in conjunction with the high indexes available this attracted a significant number of buyers. “The silent auction style system was once again well received, with eight rams in total going to live auction having reached the maximum silent auction bid of 1000gns,” explained Mr Bullock. Leading the prices at 3400gns was yearling 619/1704431, a twin born registered ram with an overall index of 212 including outstanding EBVs for 8-week weight, scan weight and FEC. He is bred by 619:01083 out of a 7-year old homebred ewe, and eventually sold to George Cullimore, for his pedigree Lleyn flock based at Kelston, near Bath, after a fierce bidding battle with several other interested breeders. Hotly-contested at 2000gns were two more high-index yearlings – 619/1704452, a twin born ram with a top 1% index of 266, was secured by new breeders Paul & Sarah Eckety, Flock 2185, who had travelled from Dorset to make their purchase. Again he was pedigree registered and sired by 619:01083. Also selling at 2000 guineas was 619/1704520, a triplet-born ram boasting an index of 220 – this 01083 son was keenly sought by 3 established breeders, but finally went home with Neil Perkins, having travelled from Dinas Island, Newport in West Wales. He had earlier given 1750 guineas for another twin-born 01083 son – 619/1704416, boasting an index of 223. At 1550gns was 619/1704425, another top 1% ram with an index of 273 – part of a final offering from the senior stock ram 619:091904, this ram will head to the South coast with Bethan and Dominic Klinkenberg. Following closely behind with a final bid of 1500 guineas, ram 619/04511 heads to the well-established flock of Lleyn sheep at Harper Adams University in Shropshire – once again sired by 619:01083 out of a 6-year old ewe. A further two rams went to conventional auction, the first of these being 619/1704494, a twin born ram with a maternal index of 256, selling to Messrs. Keswick, Rockcliffe Estate near Stow-on-the Wold for 1300 guineas. The first ram of the day to be auctioned was Lot 3 ram 619/1704396, a triplet-born ram sired by 619:01331. He went to Slawston Grange Estate, Leicestershire. Auctioneer Clive Roads of McCartneys, Worcester, said the sale had been an unprecedented success, with a large number of potential buyers in attendance. “Marcus and Kathryn are to be applauded for trying something different and the interest shown by buyers and potential buyers at the sale is testament to the work they’ve done in breeding sound, commercially relevant, functional sheep. Averages: Yearling rams £ 990.00, two year old rams £ 382.50 (McCartneys). Lleyn Flock Sees Greatest Genetic Improvement over last 10 years! Bank Farm Lleyn, owned by Marcus & Kathryn Bullock from Abberley in Worcestershire, has been recognised by AHDB Beef & Lamb as the most progressive flock of Lleyn sheep based on the flock`s genetic merit and improvement over the past 10 years. Marcus’ interest in the Lleyn breed started when he studied the breeds that were used to bring the Lleyn out of rare breed status for his degree thesis at Harper Adams. He gradually changed his flock from crossbreds to purebred Lleyn between 1988 and 1991 and now runs 600 breeding females. “I have a strict breeding policy to make sure the breed continues to move forward and so anything that doesn’t make the grade is removed from the flock. Having the figures and records behind the animals means I can easily make those selections.” When making breeding decisions, Marcus has the customer in mind so he produces animals they want to buy. “Unlike many UK flocks who are looking for the reason to retain a sheep, we are constantly looking for any reason to either cull them, or demote them to our later-lambing commercial flock” explains Marcus. On-farm auctions are emerging as a popular alternative sales platform for breeders of high-health status, performance-recorded breeding stock. Although most trading is still done through breed society sales and one-to-one direct transactions, breeders with larger numbers of rams to sell believe one-day auctions on their farms make sense in both economic and convenience terms. Clive Roades of auctioneers McCartneys says there can be benefits to both sellers and buyers. “For sellers who might otherwise have two or three visits a week from buyers for six weeks during the selling period on-farm auctions are a more convenient form of selling because all or most of the animals can be sold in one day,’’ he says. Breeders he has worked with allow rams to remain on farm after the sale, offering that additional convenience factor. “Buyers have the benefit of purchasing rams on a certain date in July but not taking delivery of those rams until a later date,’’ says Mr Roades. The Bullock family adapted an auction template commonly used on stud farms in the Southern hemisphere for what has now become their annual on-farm production sale. For Marcus and Kathryn, who run Bank Farm Lleyn near Abberley, Worcestershire, with their daughter, Kate, selling rams privately was time consuming at a busy time of the year. “As much as our customers appreciated having a slot to themselves, it was absorbing an awful lot of our time during an exceptionally busy time of the year’’ says Mr Bullock. The Bullocks seized on an auction model known as Helmsman, which they had seen operating in New Zealand’s South Island as a means of selling both rams and stud bulls. This system involved customers chalking their bids on a blackboard next to the ram they wanted to buy. Each ram had a reserve price and if someone wanted to bid higher, they erased the figure and inserted their own bid. Whilst the Bullocks liked the principle of the system, they opted for a more tamperproof, professional and transparent model, utilising the services of McCartneys auctioneers. At their annual sale, rams are set a reserve price; this varied this year from 350 guineas to 650. Each potential customer has a bidding card. “There are pens of 10 rams and as each pen is being sold, if someone wants an animal they walk up to the auctioneer and will quote the price they want to pay for that ram, at or above the reserve price and that is marked on the board,’’ says Mr Bullock. Bids are taken in increments of 50 guineas and if a bid reaches 1000 guineas that animal is auctioned conventionally. In the first two years, approximately 10% of the rams entered went under the hammer, having reached 1000 guineas on the bidding boards beforehand, with an overall yearling ram average well in excess of 700 guineas in both 2016 and 2017. “The bidding system is entirely transparent, and provides purchasers with a relaxed system of purchasing their ram(s), without the immediate pressure of a conventional auction’’ says Mr Bullock. Their auctioneer, McCartneys, is paid a percentage commission on the sale of each animal. Linking up with an established auctioneer is beneficial for pre-sale advertising, reckons Mr Bullock, who also has a database of 5,000 potential buyers who receive flyers advertising the sale, enabling them to request a sale catalogue. That number is growing every year. The sale averages around 120 buyers; to attract that quantity of prospective purchasers, a breeder must have a reputation for producing stock that will perform and without exception stand foursquare behind the animals sold. Volume of rams and consistency of quality are important too, says Mr Bullock, providing buyers with a wide selection of blood lines, but ensuring all rams sold fall within the top performing 25% of the Lleyn breed overall. The change in sale method has brought huge time efficiencies, he calculates. “Three years ago we sold approximately 90 rams, and the average sale was 2.5 rams which is around 36 different customers. That would have been 36 different private visits. The Bullocks sell maternal rams principally to other closed flocks for breeding replacements, so biosecurity is a priority for their buyers; direct sales satisfy that requirement. “After the second foot and mouth outbreak in 2007 we made a conscious decision to stop selling at society sales and to develop private sales of breeding stock directly off the farm - biosecurity was at the forefront of people’s minds and that is still there,’’ says Mr Bullock. Under new government rules, all lambs tagged from 1 January next year will require electronic identification. While this will be challenging for many, particularly upland sheep farmers, those willing to embrace the change fully could reap huge benefits. This is the belief of Worcestershire sheep breeder Marcus Bullock, who has been using EID as a recording tool within his flock of 750 performance-recorded, Lleyn ewes for the past 15 years. “There are a lot of negatives about EID out there and farmers are reluctant to embrace it because they’ve had it thrust on them and feel it is in their interest not to make it work. Although, he concedes upland sheep farmers will be hardest hit by the new measures. “I do have a measure of sympathy for upland flocks where the impracticalities of EID will probably outweigh the benefits, because of how few times they gather sheep and handle them.” Mr Bullock says it is foolish to suggest it will help improve traceability of hill sheep, when so many are lost each year. However, he believes many lowland flocks could recoup the additional 70p spent on electronic tags by looking at their management in more detail. It is this “bottom up” approach to breeding that has sped up genetic gain across his whole flock. Investing in EID has been integral in helping to achieve this. The entire flock is recorded from birth and stock performance is recorded throughout the animal’s lifetime in the flock. The nucleus flock of 300 ewes are AI’d to the flock’s top maternal sires and are lambed in two groups of 150, with the first starting in February and the second group at the end of March. “Using AI allows us to use our very best rams across a higher number of animals. “AI is massively underrated in this country. The rate of genetic progress is so much quicker using proven genetics. In fact, it is a considerable feat if ewes qualify for this group. By his own admission, Mr Bullock has a “ruthless” approach when it comes to selecting breeding ewes. “Our system is a simple, forage based system so we’re putting our ewes under a lot of selection pressure from day one and if they don’t tick that box they are down the road. The remainder of the ewe flock and up to 300 ewe lambs are lambed in April, following natural service. “On the ewe lambs we tend to use rams which we know exhibit easy lambing characteristics. “Lambing ewe lambs gives us the advantage that we can identify proven stock 12 months earlier,” he adds. Ewe lambs have to be 36kg or heavier to be considered for tupping. They are run with teaser rams for five weeks – or two cycles – before a ram is introduced for three and a half weeks. And to ensure tupping weight is achieved they are shorn in August at, or shortly after weaning. Ewes and ewe lambs that are not suitable for breeding are recorded on the EID database as a cull management group. This diligent breeding protocol is achieving a conception rate of 95% in the ewe lamb group. Mr Bullock’s scanning target for ewe lambs (it) is 110%, but in reality they are running slightly higher than this at 120-125%. At scanning, results are recorded and all females are run back through the Farm iT 3000 weigh crate which drafts them into three management groups, depending on litter size. The Bullock family adopted an anti “triplet policy” from the outset and as a result scanning target for mature ewes is around 185%. “Our records show that as soon as you go above this you increase triplets, not twins. To help control prolificacy ewe lambs that were born as a triplet are unlikely to make the nucleus flock. “Triplet lambs are more often than not the ones that fail to achieve tupping weight. “We sell on average 80-100 yearling rams a year and the majority go to commercial, outdoor, lambing flocks and they don’t want triplets, because they’re difficult to manage. All AI ewes are lambed indoors, along with singles and triplets so they can be fostered easily, while later-lambing twins lamb outdoors. As all rams sold go on to produce replacement females maternal attributes are paramount and at lambing, traits such as mothering ability and lambing ease are recorded on handheld readers, using a three -point scale of +1 to -1. Exceptionally large lambs and runty lambs are also noted and udder suspension and teat size are also prerequisites. Anything below average for these traits is recorded via individual EID into a cull group and won’t be bred again. “At times like lambing EID is a blessing in disguise because if we were still using paper recording we would struggle to keep up,” says Mr Bullock. All routine flock treatments are recorded as batch treatments using EID and handheld readers are used to document individual treatments such as antibiotics to treat mastitis cases. “We routinely treat for clostridial disease four to six weeks before lambing and lambs are dosed at four and eight weeks of age. “The only other routine treatment is pour-on. Lambs are usually treated in the first couple of weeks of May to give 16 weeks cover until August, when we shear. “We meet with our vet twice a year to discuss our health plan and because of that we are using antibiotics more strategically. “EID has been useful in making recording and administration more accurate. “We drench as we see necessary and use FEC (faecal egg counts) to monitor worm levels,” explains Mr Bullock. In fact, in the last 10 years worm resistance has become an increasingly important objective within the flock’s breed programme. Mob faecal egg counts are conducted on lamb groups and if this goes above 500 eggs per gram they will consider individually testing animals within that group. “Our first priority has been to cull out the ones that are creating the most pasture contamination. It is the bottom 10% that are producing 90% of the pasture contamination so these lambs get sent to slaughter,” explains Mr Bullock. Results are recorded on the EID database and are then sent to Signet where they’re used to calculate sire’s estimated faecal egg count EBV. “Our goal is to produce worm resistant sheep and my long-term target is a single drench for life (within the first 12 months). Weighing plays a vital role in conjunction with FEC monitoring. “If weight gains tail off, it acts as a precursor for mob egg counts,” explains Mr Bullock. As a result lambs are weighed every four weeks up to 20 weeks of age, which is when Mr Bullock conducts individual FECs and scans for back fat and muscle depth. Meanwhile mature ewe weights are recorded four times a year – at weaning, tupping, scanning and lambing, in an attempt to identify the most efficient ewes. “We are trying to identify animals that have the genetic ability to mobilise their body reserves, as a prerequisite for each stage of the production cycle. It is work we are doing hand in hand with resistance, because we have this notion that sheep that are able to do this have a degree of parasite resistance. In the last three year’s the whole flock indices for FEC has crept up from the top 25% and now sits in the top 10% alongside maternal traits. “It is not about identifying individual stars. It is all about raising the performance of the entire flock (breed) from the bottom up. Copyright © Bank Farm Partners 2014 - 2019. All Rights Reserved. Abberley, Worcestershire.